Nearly twice as many people are taking public transit to work than driving alone, and overall use has grown significantly in the last seven years. Public transit is booming in Seattle, and the number of commuters driving alone is down to a record low. A new survey shows that the number of people using public transit to get to work in downtown Seattle is now nearly double the number of people who drive alone. “We have NEVER recorded a faster transition to transit, walking, biking, car/vanpooling and telecommuting from those driving alone than in this survey, released today,” tweeted Commute Seattle, Downtown Seattle's Transportation Management Association, and a partner in the survey. Commuting by bus is by far the most popular mode of transit,at 36.9 percent, and train/light rail/streetcar is third at 9 percent. That 48 percent number also seen elsewhere in the study, as one of the highlights in the growth of public transit in the region is its 48 percent increase in use over the last seven years. Conversely, single occupancy vehicle (SOV) commutes are down nine percent in the last year alone. Among reasons cited in the joint press release from Mayor Jenny Durkan, King County, Sound Transit and Commute Seattle is the investment in transit expansion, which has led to light rail ridership growing from about 38,000 average weekday riders in October 2015 to more than 73,000 average weekday riders in October 2017. 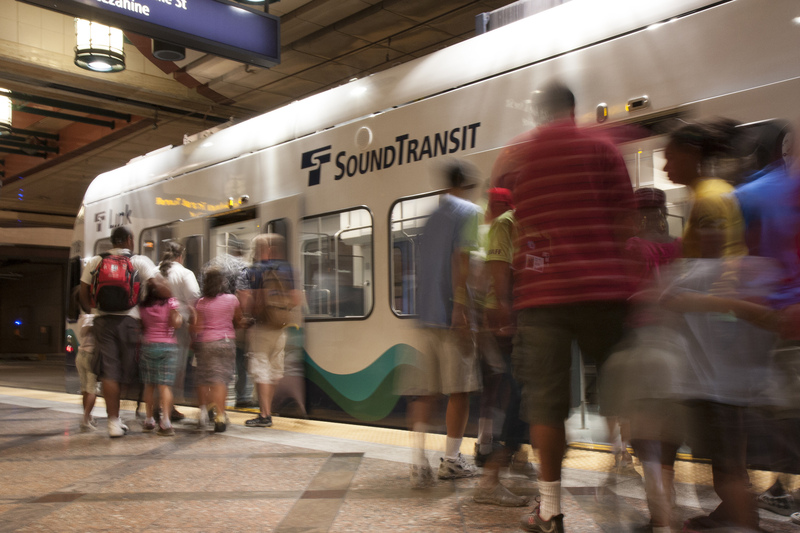 The study says that “the share of light rail and Sounder trips has more than doubled since 2010, with the greatest increases occurring since the opening of the U-Link and Angle Lake light rail expansions in 2016." The chart below shows that change both for commuters at larger Center City businesses affected by the State of Washington’s Commute Trip Reduction (CTR) Efficiency Act, and those not affected. Commute Seattle also referenced the “virtuous cycle” that leads to better public transit in the city. One reason why transit ridership is booming is what we call Seattle's "Virtuous Cycle"
Looking ahead at what’s to come for transit in the region for the next 20-plus years? See our recent infographic on the “Transportation 2040” plan. PLUS: See our April 2016 cover story on transit-oriented development in the region, and see that full issue here. See the full results of the survey, including many more charts here, and read the full press release below. SEATTLE (Feb 13) – With nearly half of commuters relying on transit for their daily commute, new survey results released today by the Seattle Department of Transportation and partners at Commute Seattle show that in Seattle more commuters are relying on transit, walking, rideshare, and biking. Public transit (bus, light rail, streetcar and train) remains the top choice for downtown commuters (48%), with ridesharing (carpool, vanpool) holding steady at (10%), walking (8%), bicycling (3%) and teleworking (6%). According to the 2017 Center City Modesplit Survey, transit use has skyrocketed by 41,500 in the last seven years in downtown Seattle during the peak morning rush hour. Walking, biking, and rideshare, including carpool, saw gains of thousands of trips per day. Conversely, the percent of commuters driving alone has fallen to 66,500 single occupancy vehicles - the lowest rate since this survey began tracking trends in 2010 and a reduction of nine percent over the last year. The survey illustrates an overall decrease of approximately 4,500 single-occupancy vehicles in the city, despite employment growth of approximately 60,000 jobs since 2010. “We’re committed to giving commuters options. The rapid growth in the city, especially in downtown Seattle, requires us to be more innovative about how we move people, whether they drive, ride transit, bike, or walk. The survey’s results show that our continued investments in transit are paying off. We’re excited to continue our partnership with Commute Seattle and others so that we’re developing ways for everyone to move in, around and near Seattle easily and affordably,” said Andrew Glass Hastings, Seattle Department of Transportation Director of Transit and Mobility. Investment in the expansion of transit service: Through the voter-approved Seattle Transportation Benefit District, the number of Seattle residents living near frequent transit jumped from 25 percent in 2015 to 64 percent in 2017. Since the opening of the Angle Lake, Capitol Hill, and University of Washington stations, the light rail system swelled from 38,297 average weekday riders in October 2015 to 73,232 in October 2017, the period during which the most recent Mode Split Surveys were conducted. Metro Transit has aligned buses to connect riders with higher frequency service to new light rail stations and also invested in additional hours. Metro RapidRide Lines in Seattle (C, D & E) now carry 41,000 daily riders and the C Line has grown 150 percent since launching in 2012. Together, Metro Transit and Seattle have increased transit service in Seattle and King County by 13 percent since 2014 – totaling more than 400,000 daily bus rides and 122 million rides each year. Significant efforts by employers and the business community to support better commutes for their employees: SDOT and partners at Commute Seattle work with 270 large employers as well as smaller worksites in several focus areas of the city, to promote and support investment in smart commuting solutions. The Center City Modesplit Survey indicates that large employers are maintaining very high rates of non-drive alone commutes, with only 24 percent driving downtown, while smaller employers are quickly catching up, with their drive alone rate dropping from 47 percent to 27 percent from 2010 to 2017. New Housing in Center City: New downtown housing options have made it possible for more people to walk to work. It is estimated that more than 20,000 workers or eight percent are traveling to work by foot in the center city. Together with cyclists, active commuters account for around 11 percent of all daily commutes downtown. The data collection effort took place in late October, and follow up questions indicate this number is higher in summer months. “Downtown Seattle has added thousands of jobs over the past decade; infrastructure improvements and private development are both occurring at a fast space. But we are adaptable. Downtown Seattle commuters are embracing smart mobility options during a period of tremendous growth,” said Commute Seattle Executive Director Jonathan Hopkins. The Center City Modesplit report is typically released by the City and partners at Commute Seattle every two years; however, SDOT funded additional data collection this year both to better track downtown trends as well as better align data collection. Approximately 55,000 surveys are gathered in the Center City via SDOT’s state mandated Commute Trip Reduction (CTR) program. To this, nearly 2,000 responses from smaller employers are added to provide a full, statistically weighted picture of commute trends downtown. For more information about the survey, please visit https://commuteseattle.com/modesplit-2017.